Locals have enjoyed ridin’ the rolling terrain south west of Calgary since the 1800’s. Today the roads are better and you can cover more ground on a bicycle than you ever did by horse. There’s still plenty of both in these parts so you’ll be among friends. 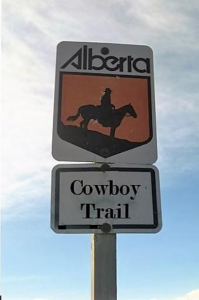 The Chinook Classic route includes the famous “Cowboy Trail“ (HW 22). This artery cuts through ranch country and marks the junction of prairie, foothills and the Rocky Mountains. For kicks we include another stretch of highway known as the “Road to Nepal“. This 10km portion begins at our host venue Granary Road (bottom of “Spec Hill“) then continues south to highway 549. If you’re ridin’ the Gran Fondo, you get to take it on twice! But don’t worry, half of it’s down hill. Through the day, if you start to tucker, just look west; the view has helped the tough get goin’ for generations. 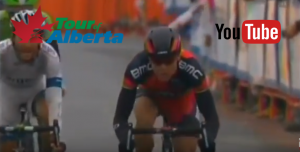 By the way, these roads were riddin’ by some of the best in the 2013 Tour of Alberta. Here’s Tour de France and eventual stage winner Cadel Evans at the intersection of 773 and 549 (in the drops & big chain ring).